The gold and silver markets took a breather last week, after showing some strength in the preceding three weeks. Economic data on GDP and employment were mixed. Traders had trouble predicting how the data might impact the only economic fundamental that seems to matter in today's markets – Fed policy. 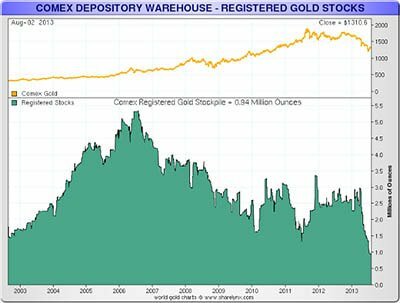 Meanwhile, metals investors should take note of the alarming drain of physical gold and silver from warehouses at the market exchanges. Data reveals that strong hands across the globe are snapping up physical gold at an extraordinary rate, setting the stage for fireworks in the precious metals markets in the coming months. The relentless selling of gold futures, beginning in April, gives the superficial impression that there aren't too many investors interested in holding gold. The Fed is supposedly getting ready to wind down the printing presses. Investors should sell gold and hold dollars. Look more closely at the action in the Futures markets and you'll see a much different picture. While there are certainly fewer investors interested in holding paper gold, the desire to hold physical bars is tremendous. As spot prices have fallen, the number of investors who are standing for delivery on their contracts has accelerated. Inventories of "registered" gold – meaning gold available for fulfillment of a futures contract – stand at the lowest level in more than a decade. There is less than half of what there was during the height of the 2008 financial crisis. And the precipitous drop from nearly 3 million ounces of delivery-ready gold to less than 1 million ounces occurred in less than 4 months' time. Committed "longs" are leading an epic drawdown of exchange inventories. The chart above represents physical gold moving from weak hands to strong hands. These investors are more than simple bargain hunters who would likely avoid the cumbersome process of taking delivery and settling for cash. They are demonstrating a longer-term bullish outlook and a preference for physical possession. This migration figures to have some very significant implications for gold (and silver) spot prices. Maybe sooner rather than later. Unless some force reverses the current downward trend in inventories, the COMEX will be facing delivery issues in the next few months. Dramatically higher gold prices are likely to be the force. Tuesday, Aug. 6th – International Trade. Recent dollar strength has the trade gap widening once again, with imports far outpacing exports. The recent Fed posture for reducing stimulus is supporting this trend. Wednesday, Aug. 7th – Mortgage Bankers Association Purchase Applications. The recent rise in mortgage interest rates immediately put a damper on applications for mortgages – both to purchase a home and to refinance. But over the past few weeks, rates have stabilized and even drifted back lower.